The (Re)Building A Kidney consortium https://www.rebuildingakidney.org coordinates research for generating or repairing nephrons that can function within the kidney. 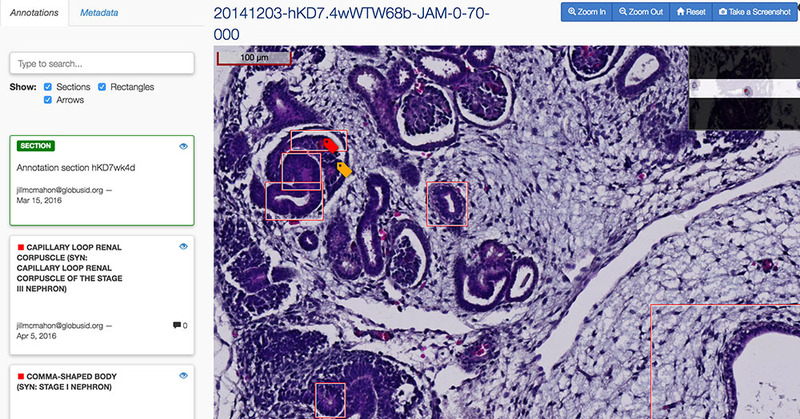 ISRD is building their collaboration and data publishing infrastructure including a new Image Annotations viewer that allows users to zoom into high quality images of kidney cells and create, edit and share annotations. ISRD has been using our Chaise/ERMrest software to develop new ways of viewing and annotating high resolution images of kidneys. We developed the Image annotation viewer to allow users to zoom into regions of a kidney MRI image, select an area, provide annotations and view and organize existing annotations, much like some common consumer apps such as the tagging option in FaceBook. Our faceted search also allows users to filter available images by various attributes.